Gloomy weather in Hong kong as a cold front crossed the south China coast last Friday, 22nd January. However, the change in air pressure - or was it the wind ? 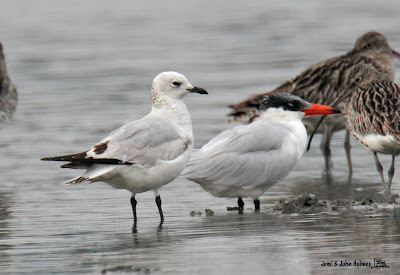 - caused the tide to rise to an ideal height (higher than predicted) for bird viewing at the Mai Po Boardwalk hides. There were only two of us in the hide, and one of us had "bunked off" his university lectures to be there. He picked a good day to do it. 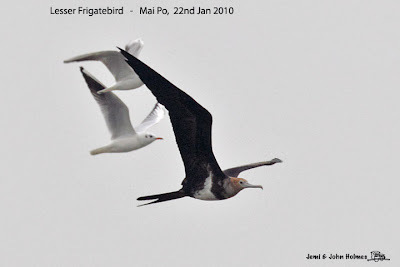 Three views of a Lesser Frigatebird - we only get about one a year on average..
and Relict Gull, perhaps the same one seen out in the bay a fortnight ago. Dalmatian Pelicans used to be quite numerous in Deep Bay. 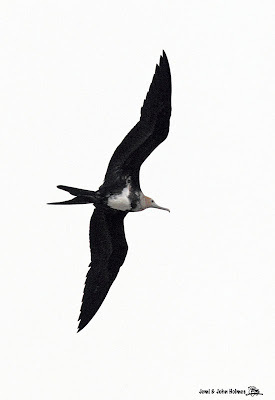 In the dim and distant past, - in an era when fieldscopes were cruder and field guides to East Asia non-existent - they were misidentified as Spot-billed Pelicans. 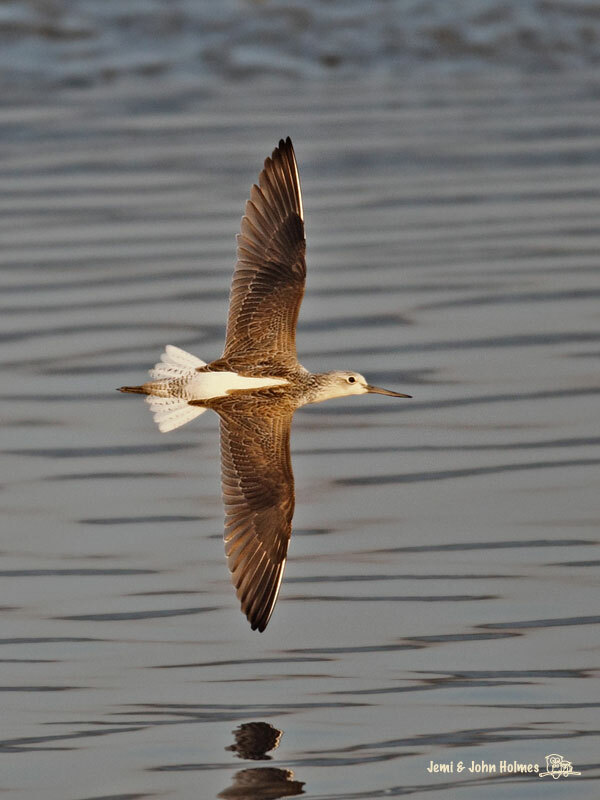 Deep Bay's highest-ever Pelican count was a flock of 85 on 21st February 1960. This was when Harold Macmillan was Prime Minister of Great Britain and Dwight D. Eisenhower still President of the USA - yes, a long time ago. 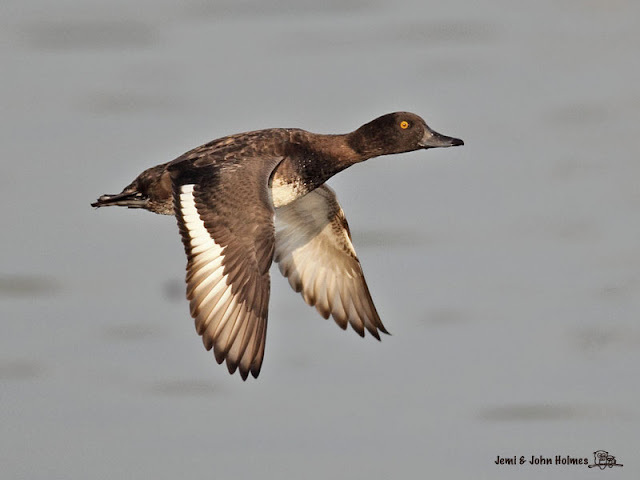 regular wintering numbers fell steadily, and were around twenty-something in the 1980s, one of my early memories of Deep Bay. 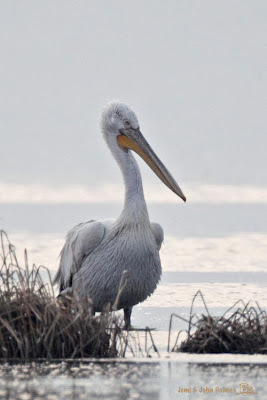 It was a mark of how long some people had been birding in Hong Kong that they would boast about how many Dalmatian Pelicans they could remember seeing in Deep Bay. You know, the same people who ( probably under the influence of alcohol) would tell you that they remembered tigers ambushing people at bus queues in Nathan Road. But I digress (As the great Tom Lehrer used to say). As recently as 2006 there were 14 Pelicans in the Bay in late winter, but then in successive years the figure were 2,0 and 1. 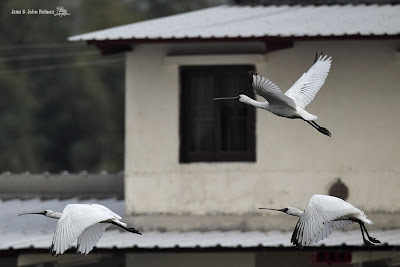 Thanks to better observer coverage in mainland China, we know that about a dozen Dalmatian Pelicans have been wintering in Haifeng, eastern Guangdong Province. They might be "our" group, taking advantage of climate change to not come as far south, and good luck to them if that is the case. This winter a solitary Pelican turned up in mid-December (2009). So here he is - the last of the Pelicans; regarding his surroundings on the mudflats on January 2nd, 2010. He was last definitely seen in Deep Bay on Sunday January 3rd, but - despite a lot of people looking - not noted since. "Ladies and Gentlemen, Elvis has just left the building....."
Good number of Tufted Duck this year have even managed to outnumber the weekend photographers at NSW. Nam Sang Wai is great when the morning sunshine forms a catchlight in the eyes of the birds. But once it clouds over, it becomes very hard to capture any decent images. 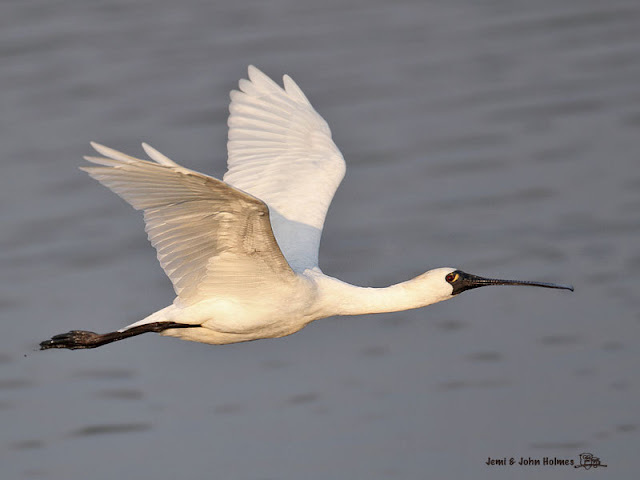 At Long Valley in mid-week (13th January) I was having a fairly quiet morning when I saw a Black-faced Spoonbill circling in the blue sky. It dropped out-of-sight into a high-banked fishpond. Carefully peering over the bank, I beheld the sight of a record (for Long Valley) NINE BFSs on the pond. The pond was partially-drained, and the spoonbills were feeding with Black-winged Stilts, a Grey Heron and Egrets. 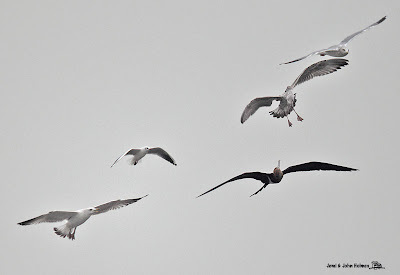 With the 800mm I could not get them all in the frame at once. 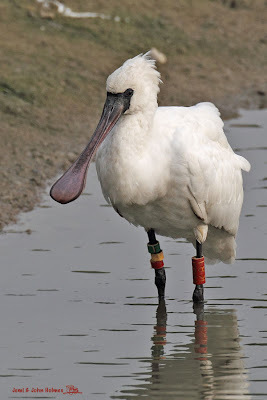 The spoonbills included colour-ringed K81, which has been noted at LV before. For several years there was only a single record of BFS at Long Valley, but with the habitat management there up to three had been noted regularly earlier this winter. Confident there would be very few Black-faced Spoonbills to be counted in Deep Bay in late afternoon, I had promised to assist in a Spoonbill survey. Thus at 15:45hrs I was cycling to the boardwalk at Mai Po Nature Reserve. 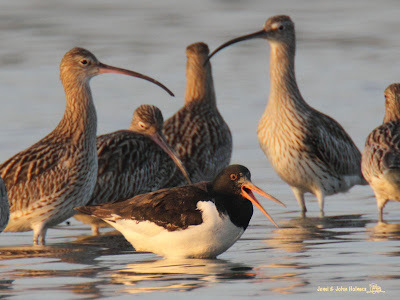 My impersonation of virtue was "rewarded" when I got a message from Mike "Chiu Yan" Kilburn to the effect that there was an Oystercatcher on the Deep Bay tideline. On a glorious sunny afternoon - twice as nice because of all the gloomy weather recently - it was still there when I got to the hide. 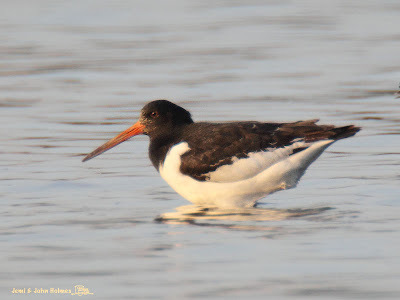 This was -officially- HK's third Eurasian Oystercatcher ( well fourth if you consider that the second appearance of the species involved two individuals, but I digress) casually basking in the glow of the evening sun. 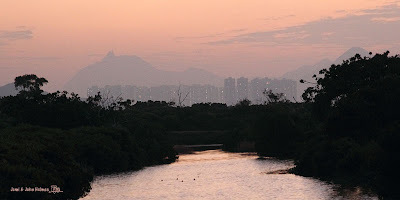 Long Valley, a rare-and-precious freshwater wetland in Hong Kong, was saved from the Kowloon-Canton Railway Corporation's intention to split it in half with a viaduct several years ago. But now, the government, probably under pressure from the usual clique of landowners, has proposed re-zoning the land use of LV from "Agriculture" to something new, unique and dangerous-looking. 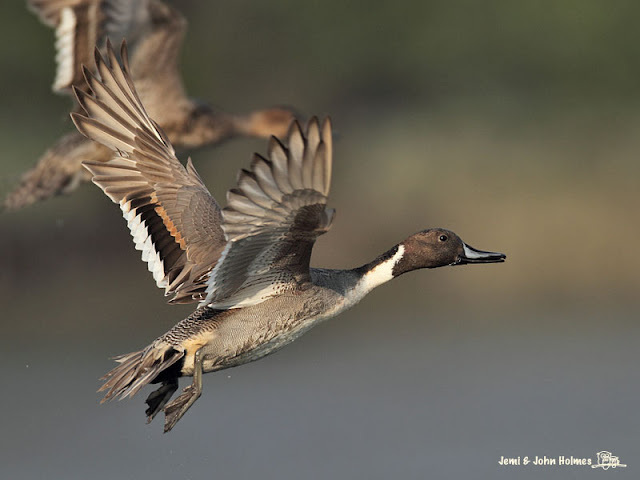 Long Valley is currently zoned for "Agriculture" and, largely because of this cultivation, this freshwater wetland has been known for years to have a high value for wildlife. Indeed, the ecological value of Long Valley was set out in full during the debate and legal proceedings that followed the stated intention of the KCRC to put a railway line through the middle of the area a decade ago. WE OBJECT to the rezoning of Long Valley as a "Comprehensive Development Nature Conservation Area" If this goes ahead, there is likely to be a rush to piecemeal commercial developments, each with "Conservation" only a word in the project proposal. Fragmentation and degradation of this unique area would surely follow. 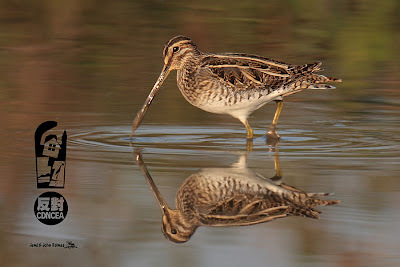 We support the HK Bird Watching Society's counter-proposal that the government should resume Long Valley up to the boundaries defined in AFCD's website. 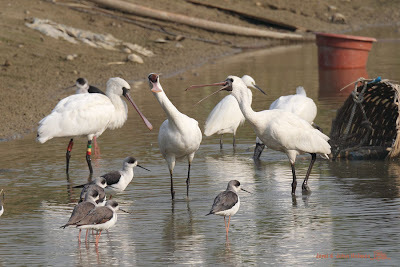 Over the past twenty years we have shown a lot of birdwatchers (local, mainland Chinese and foreign) around Long Valley. All the visitors have been delighted and surprised at the variety of wildlife in this unique habitat, where nature and human activity co-exist. Long Valley has outlived the KCRC, but it may NOT survive the attentions of developers if your department's proposed rezoning goes ahead. The government of any "World City" worth the name should be able and willing to preserve genuine green space for nature and humans alike, now and for the future. For these reasons, we strongly urge you to rezone Long Valley purely as a Conservation Area, NOT a "Comprehensive Development Nature Conservation Area". I'm not being more pretentious than usual, but I can't remember what we call this in English. 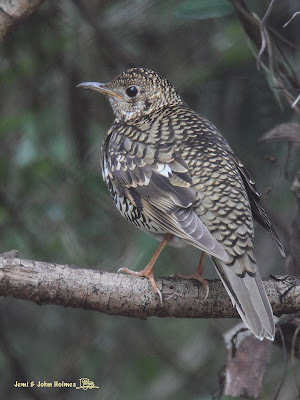 I first saw this in Hong Kong on Christmas Day 1986 and it was "White's Thrush" , after Gilbert White, Vicar of Selborne and pioneer observer of nature in the late 18th century. Later, we were entreated to refer to this as "Scaly Thrush" - a passable descriptive name, after all - but recently the himalayan and non-himalayan migratory populations have been proposed as a "split". Our Zoothera daumas are winter visitors, so they must be the migratory ones like the one that White recorded near Selborne, right ? So it's "White's Thrush" again, I think. Himalayan "Scalys" are altitudinal migrants and won't get this far. Anyway, on New Year's Day, we've got a whole new decade to get to the bottom of this.